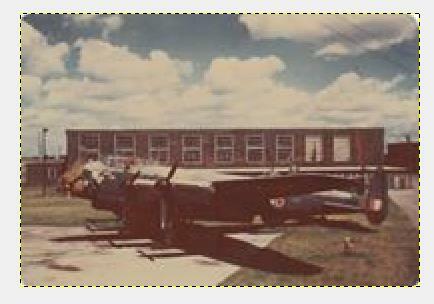 In the spring of 1944 Victory Aircraft, located in the small town of Malton Ontario was completing bomber number 721, a Lancaster X , the Canadian version of the Lancaster four engine heavy bomber. Once completed KB721 was prepared to be ferried to the UK. It would be April before KB721 arrived in Britain where it first went to the Avro Aircraft facility in Woodford. Woodford was a production, testing and repair area which had a long history in the production of Avro products. Here KB721 would be checked over by Avro before being sent to the A.A.E.E. A. A. E. E. which is the shortened form of Aeroplane and Armament Experimental Establishment was located at RAF Boscombe Down. It would be here that a series of further acceptance testing would be performed on the aircraft, guns and other equipment. It's over all performance would be checked and finally the sign over to the RAF. Not all aircraft of the same design fly the same, some have eccentricities that can be mechanically corrected. But in others the "bad habits" stay with the aircraft. 419 Squadron had already received KB719 and KB722,723 and others in that series during April and May of 1944. Why KB721 did not follow her sister serial numbers during those months is unclear. Whether it had some kind of major problems that needed doing or it was with another squadron before coming to 419 has no answer at this time. By August of 1944 KB721 was finally ready to be assigned to 419 squadron and designated VR-E. Replacing KB708 which had been VR-E up until a fatal crash landing at RAF Boscombe Down on August 26th. KB721 flew it's first operational flight on September 10th. The aircraft was shared by many different aircraft captains and their crews during this time. With F/O A.M. Roy and F/O Laurence Blaney flying the aircraft the most. From October 12th right through until November 2nd. 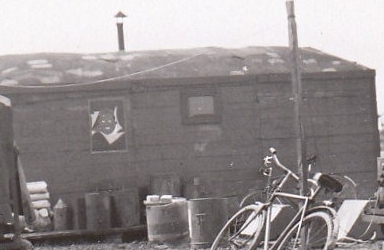 "Esky" was home of F/O Blaney's crew. Flight Engineer former Sergeant Stan Instone does remember it with that name and that it had nose art looking something like a Viking. On Sgt. Instones webpage is a copy of a picture painted by Wireless Operator Andy Kindret which has that nose art on his painted Lancaster. While home bound from Essen Wireless Operator Andrew Kindret observed an enemy aircraft moving port to starboard quarter of "Esky" approximately 350 yards out. The night fighter had been silhouetted by the light sky behind him. The FW190 made his attack from astern, F/O Blaney threw the Lancaster into a corkscrew move to starboard. F/S Lanctot opened fire with a short burst of 200 yards as the fighter came into 150 yards of his Lancaster. Lanctot's gun jammed and he was unable to clear the jam. The enemy fighter broke off the attack at 100 yards heading down the starboard quarter without firing at VR-E. Meanwhile the Mid-Upper gunner F/S Atham had spotted another aircraft on the port side of the Lancaster, nothing more was reported on this aircraft. No damage was claimed on the fighter and the crew continued course back to base. On the night of November 4th 1944, "Esky" was on it's 16th operation and the F/O Lawrence Blaney crew were on their 4th sortie with VR-E. The targets defences were strong and flak and night fighters were making themselves felt by the crews of the bombers. F/S Lanctot in his rear gun turret spotted two enemy fighters just below the horizon one on each side coming in from astern. The first one to make a pass was the twin engine Me110. At 400 yards it opened fire as did Lanctot. The rear gunner kept up the fire until his turret was knocked out of service by the massive assault of canon and machine fire from the night fighter. Lanctot had made a number of hits on the Me110 as witnessed by Kindret. Now the second night fighter began it's attack. The Me109 began firing at 250 yards. This time it was up to Sgt. Altham to drive off the attack from the upper gun turret. Hits and a blue flash were seen on the single engine attackers fuselage. Once the attacks had finished, Lanctot then left the crew know of his wounds to face and one arm. The Lancaster itself was in a bad way the heavy canon fire and machine gun rounds had blasted most of the rear turret, the starboard elevator had been shot away, heavy damage to starboard fin and rudder. Damage to starboard wing and flaps added to the damage list. The pilot F/O Blaney brough the damaged aircraft into Woodbridge, where the rear gunner F/S Lanctot received immediate medical aide. The Combat Report shows that an Me109 and ME110 were involved in the attack although the crew reported later also seeing an Me 262, Me 163 and JU88 in the area. F/O Blaney performed a corkscrew to starboard while F/S Lanctot managed to fire off a number of rounds until he was hit and Sgt. Althan in the M/U turret fired off his gun at the attacker. The Me110 opened fire at 400yards then broke off the attack at 150 yards diving down on port side. Lanctot's accuracy was seen by the wireless operator as the rear gunners bullets hit the on the enemy aircraft. As the Me110 finished it's pass the Me109 closed in from the port fine quarter down only becoming visible to the M/U gunner when the fighter was just 300 yards off. When the fighter was within 250 yards Altan fired off additional rounds making hits on the enemy aircraft, a blue flash being seen on the fuselage before it broke away at about 200 yards. Both the two enemy fighters were seen to take tracer rounds to their fuselage from the Lancaster's two set of guns. A claim for "Damaged was submitted for the Me110 and a "Probably Destroyed" for the Me109. With the rear gunner F/S Lanctot wounded during the attacks, F/O Blaney made a landing at Woodbridge to allow more immediate medical attention to the wounded gunner. F/S Lanctot received the DFM for his actions on that night. Damage to the bomber itself included starboard elevator shot away, fin rudder riddled with cannon fire, starboard flaps and rear turret shot up, r/t out of service. The Me110 was listed as "Damaged" and the Me109 as "Probably Destroyed" and the damaged Lancaster was in for some heavy repairs. 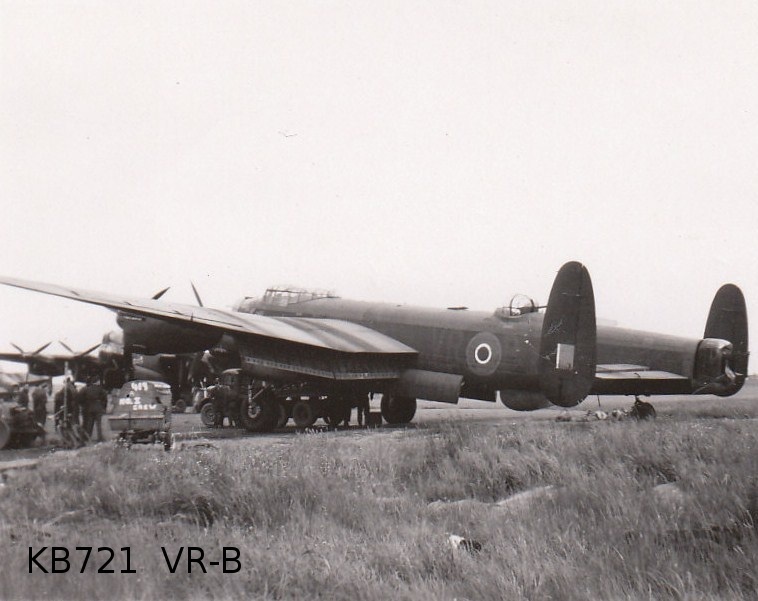 "Brick Bradford" and "Linden Rose"
It now became VR-B replacing KB779 VR-B which was lost on December 7th of 1944. The new VR-B had the cartoon action character Brick Bradford as nose art the same artwork which appeared on the ground crews makeshift dispersal hut. No documented information on who selected the artwork or name, although F/L Cave was by far the most assigned crew to KB721 at the time. Over the months from December 18th up until March 21st KB721 was the aircraft which carried many different pilots and their crews on operations deep into heavily defended industrial areas of Germany. Now from this date in March until its return home to Canada VR-B became the aircraft assigned to F/O William "Smitty" Smith. 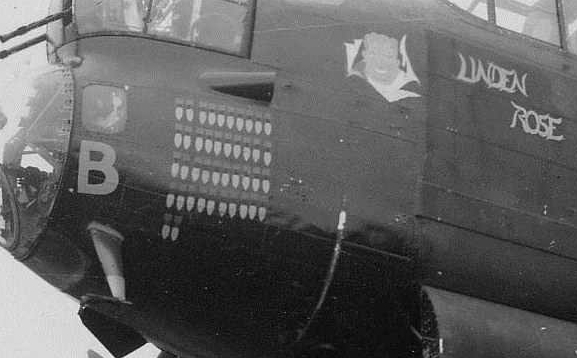 The nose art of VR-B would also now receive a new addition to right of the "Brick Bradford" character. 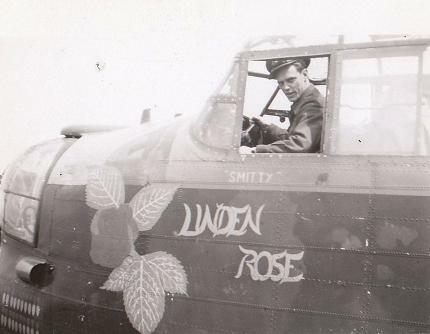 And "Linden Rose" was born and proudly displayed in a photo with the Smith crew and showing 42 sories completed. F/O "Smitty" derived from the first three letters of his daughter Linda and son Dennis's names. The new name shared a place on the nose with the drawing of Brick Bradford for a time, perhaps out of respect for the crew who had named her previously. In time the "Linden Rose" art work was enlarged along with the addition of Rose. 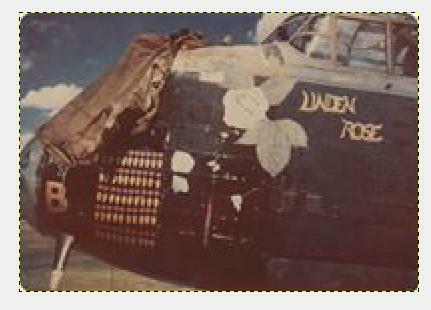 "Linden Rose" continued operations into Germany, including a number of daylight raids right up until the end of April of 1945. The month of May would bring "stand-downs" almost every morning and by May 9th the air war effort came to an end. But the adventure was not over for KB721. No time was wasted in getting into action for the longest cross water journey most of the pilots and crews had ever been assigned to, with the V-E party still most likely ringing in their ears, on May 9th twenty-two crews were selected to transport the Lancasters back home to Canada. Part of the RCAF's contribution to the war in the Pacific was to provide a bomber wing for "Tiger Force" and the Lancasters were ear marked for that joint operation with RAF, USAAF and RAAF. F/O Smitty Smith along with his, Navigator and wireless operator had a great deal of training to do in a short period of time. All pilots had now to be trained in "Beam Flying" . And they all had to go back to training in a Link Trainer to become familiar with this type of guiding the aircraft from point to point. Navigators were heavily involved in learning Astro Navigation, taking every available opportunity to learn to navigate by the sun, which was doing it's best not to shine during the first week after V-E Day. Navigators were also listed as taking part in something called "Dry Swim" . The Wireless Operators were trained on Department of Transport procedures something that would allow them to communicate with the airports and flight path traffic they would be encountering at points along the route to Nova Scotia. With the cross country training, astro navigation and D.O.T. procedures completed the next step was the trans-Atlantic journey itself. F/O Smith, crew and some of the ground crew along with their kit and spare parts stored aboard take off for the long and some what indirect path for the shores of Canada. June 10th found Smith and KB721 among others taxing their aircraft to in front of the buildings of the RCAF Station at Digby. For many the last time they would be flying into danger, for others and the aircraft a short respite before the training and modifications for the Pacific war. After completing 54 operations and a second cross Atlantic journey KB721 would await another call to action which would never come. With the end of the war in the Pacific, "Tiger Force" was no longer needed. Aircrew men, ground crewmen would all receive their letters releasing them from duty. KB721 would serve on briefly now become a training aircraft and in use up until the 25th of November 1948. An Undeserved End and Story Twist. Later in 1948, the Lancaster was sold as scrap to a man in a town in South western Ontario south of Brantford, who was a distant relative of my father. In the early 1950's my father, an ex-419 ground crewman had visited his relative where he bought a trunk load of what today I would now recognize as hydraulic equipment. The equipment most likely belonging to KB721, for it was the only large aircraft purchased by the man. The bits and pieces were in the basement of our house for many years up to the late 1950's.